Manila, Manila.. I keep coming back to Manila…. Hello Manila! I’m back and ready to go!!! I meant to update this sooner, but it’s been mad these past few days with all the preparations. Currently, me and my dad are in the Philippines getting ready to hold the Annual Kois & Ponds Grow Out contest and we are sooo excited!!! In just three days, hobbyists who have been honing their Koi keeping skills will see their efforts culminate in a Grow Out Competition. Devin Swanson will be joining us this year! Yay! 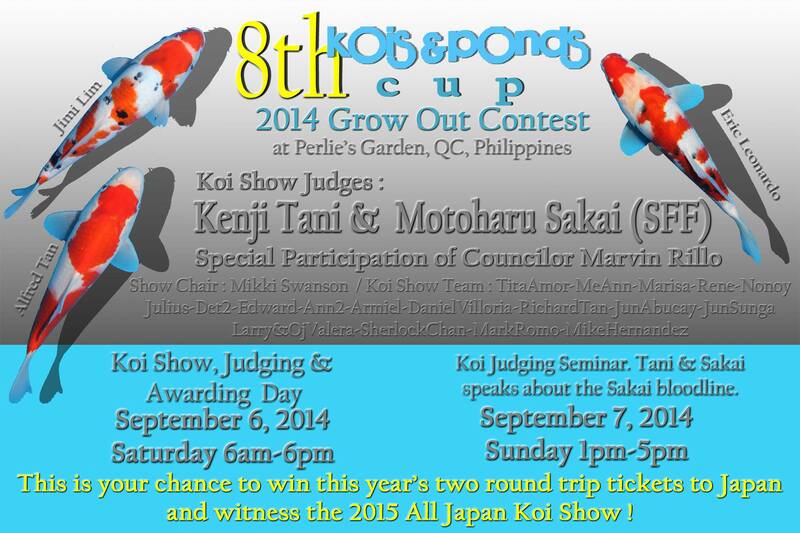 He will be part of the judging team together with Tito Kenji Tani and Motoharu Sakai of Sakai Fish Farm. The Show will be a one-day event on the 6th of September followed by a judging exercise on the 7th, Sunday. Everyone is welcome to attend on both days and I will be posting the mechanics and awards list shortly on my blog. I’m so excited to see everyone in Manila again, so if you have any questions about the show or you just want to say hi, please don’t hesitate to contact us or visit us at Kois & Ponds in Manila.